84 What’s In Her Beach Bag? 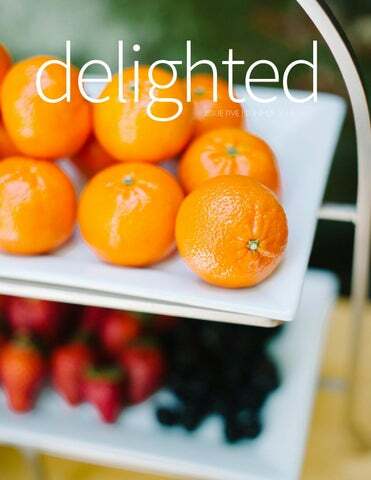 I can hardly believe it…Delighted is celebrating its first anniversary! I am so grateful to you, the reader, for your support for Delighted over the past twelve months. I have appreciated your emails, your facebook follows, your words of encouragement, your contributions, everything! 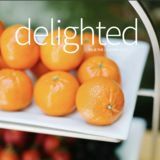 The idea for Delighted came from my desire for a creative outlet and a need to personally challenge myself. I chose to fill pages with things I adore, things that interest me, and things that make me smile. I love hearing real-life stories from business owners, mothers, designers, and those who devote themselves to giving back. It has been great fun to “virtually” meet talented people from around the globe whose creativity and style fill the pages each issue. As Delighted begins its second year, you will notice a few aesthetic changes (hence the new logo) but our content wil cosistently bring ideas and inspriation for living a full life. If youâ&#x20AC;&#x2122;d like to contribute to a future issue, email hidelighted@gmail.com! or summer entertaining. By bringing ts outside we can create a beautiful enjoying a meal with friends. e typical jungle style. By subtly the outdoors into the home, you and feel of the jungle. Four-year-old Caroline’s bedroom is not your typical child’s room. It’s delicate yet playful style is a perfect example of how pretty can work just as well as­—or even better than­—cutesy. Q&A With Mom and Designer Marianne Brown What is your favorite feature of Caroline’s bedroom? My favorite feature of Caroline’s bedroom is her bed. It was mine when I was young, and my parents had bought it at an estate sale in Washington D.C., so it’s quite old. It used to be white with the rope detail painted green and I decided to paint it a french blue with white rope detail because I thought it would be a fun color combination with the red and white custom-made striped duvet. some bright colors but made sure there was still a nice calming feel to it at the same time. to put a cute play tent, but I feel like those decor items might be better in the playroom. Nostalgia. I love adding vintage pieces. Things that I grew up with, and even things their grandmothers had when they were young (like the Bunnykins china and vintage framed art and photos). I think it not only helps give them a sense of where they came from, but vintage pieces have a sweet innocent quality to them. The most successful rooms in your homes will always be achieved by putting a lot of thought and meaning into the rooms. Decorating just to decorate is never as fulfilling for me as decorating with the person in mind and infusing a lot of personal touches that will enrich the lives of those living in the room. Designwise I could have done a lot more to Caroline’s room, but I edited on purpose, chose comfort over style, and didn’t go over the top because I want a sort of simpleness and calmness to be communicated to her through the decor. ristin's goals around remodeling centered around the desire to fully inhabit her home. She'd recently split from her boyfriend who'd been living there and she wanted to 'reclaim' her space and have her home reflect who she was in the present. She used the opportunity to breathe new life into her home and invest in making it special for herself. We replaced the windows, revamped the attic, remodeled the bathrooms and then finished with decorative elements of furniture, paint and wall coverings. The custom vanities, tile design and custom color mixes allowed Kristin's Victorian to come to life and remind her of all her unique qualities. What was your main inspiration for Kristinâ&#x20AC;&#x2122;s remodel? What is your favorite element in this remodel? I loved Kristin's art and pottery collection. She has gathered pieces from her travels so each is filled with sentiment and a sense of place; those are great references to anchor any design. Too, Kristin's home is situated high on the hill in Noe Valley, San Francisco. Her stunning views overlook the city and the Bay. While I love the game room in the former attic, I really love her Master bath. We incorporated ceramic tiles from a trip to Morocco into a pinwheel design. It's simple and very effective. I strive to create balance and truth in communication, design and life. Scale and layered texture delights me and quality elements made with mastery and love always endure. Lastly, design requires collaboration. Nothing brings me greater joy than discovering and creating beauty and working with others to achieve something great. What design style is your favorite? I am a Mid Century modern fan. EVERY SO OFTEN YOU FIND A STATIONERY DESIGNER WHOSE WORK MAKES YOU SMILE. LISA WILLIS OF MISSIVE IS ONE OF THOSE DESIGNERS. HER STYLE IS THOUGHTFUL, CLASSIC AND OH SO PRETTY. tion—signature, calligraphy. What is Missive? boundaries. After four years of selling on Etsy, I’ve just launched my own custom portfolio and ecommerce site at missivepress. com, and I will say that I’m very happy to have checked that one off of my never-ending to-do list! Of course, it will grow and evolve—I plan on adding a line of wedding and baby stationery, but all in due time. magazine which was truly one of those ‘pinch me’ moments that will keep me creating! What has been the most rewarding part of owning a small business? want to be with your business, if you truly love what you are doing. Wearing is Giving Don’t you love it when a fashion-forward company strives to make life better for people around the world? FIGS is one of those companies. Founder and CEO, Heather Hasson, gives us a glimpse into the world of starting and running a business that gives back. because they could not afford a uniform. I thought, if they just had a uniform, their entire future could turn out differently. I created FIGS to do exactly this – give these children uniforms so they could get an education and have access to all the freedoms an education provides. A few years later, I found a way to help the medical community as well. While traveling to various communities around the world, I witnessed millions of healthcare providers treating patients in dirty t-shirts and jeans. They could not afford the appropriate attire (scrubs) that help them perform their job safely and effectively. We have been able to reduce the infection rate tremendously by giving our medical uniforms to healthcare providers in need around the world. will continue to donate scrubs to hospitals and universities as they travel far and wide on their medical missions to help others in need. What countries benefit from the sale of FIGS scrubs? We have donated scrubs to medical professionals in Democratic Republic of the Congo, Ecuador, Kenya, Nicaragua, South Sudan, Honduras, among others. How do you connect with the hospitals, clinics, and schools that receive the uniforms and scrubs that you provide? We have built strong partnerships with universities, hospitals and healthcare organizations. Some of the organizations we work with include International Medical Corps, Blanca’s House, and MAMA Project. of the time, I am not even aware of what the rules are. Kidding aside, I have never been afraid of challenging the status quo. It is the reason I get up in the morning every day – to push boundaries, change perceptions, and give back. Can you provide any words of wisdom to others who may be looking to start a company that gives back? Figure out if your business makes sense before tackling your social mission. The more successful your business becomes, the more you will be able to give back and help others. Giving back is a lofty goal but it needs to be backed up with real business execution. Make sure you have both pieces of the puzzle before moving forward. Sarah Kim-Puangsuvan of Hello Monday Hello Monday is a new design company started by creatives Sarah and Lindsay. Combining their talents, they offer creative branding, website design and marketing services. Can you tell us a little about what you do? My design partner, Lindsay and I started a graphic and web design studio called Hello Monday Creative back in January. We are a full-service design studio with projects ranging from branding/print/ marketing to web and blog design. I create all the design aesthetics for clients and Lindsay is the web coding guru and makes everything come to life! What does a typical work day look like for you? me to be off the computer so that we can spend some quality time without any distractions. I make an effort to designate "office hours" for myself and clients. I give myself an hour lunch break and also mini breaks within 9-6pm to walk our dogs. For me, working from home can take a bit more discipline to strike that work and personal life balance. I would say the best tips are to be disciplined, give yourself set work hours, and dressing up as if you are actually going to work at an office helps a lot! It's all about turning your mindset to "work mode". When not at your desk, you can be found... Either meeting friends, spending time with my husband, going for a run, or in the kitchen cooking! Summertime CENTERPIECES Looking for creative ways to adorn your dining table this season? We have three bright, summery ideas for you. And the best partâ&#x20AC;Śthey will look beautiful both indoors and out! Sugared fruit is a fresh, colorful and delicious way to incorporate natures candy into your table settings this season. Use your favorite fruit and arrange them with fresh flowers, in a bowl, or on cake stands.The possibilities are endless with these sweet beauties, so get creative! you go. Continue to sprinkle and rotate, as the first few layers will dissolve into the egg whites. When the coating turns white, add extra sugar to a few spots to create a pretty frostlike look. Let dry for 30 minutes on waxed paper. Arrange dried sugared fruit in a bowl or vase. For an extra sweet centerpiece, add fruit to a floral arrangement or in various bowls along with flowers on your table! These summery striped centerpieces for your garden party created with just a few supplies to create a beautiful and eye-catching look. STEPS With your paintbrush add a thin coat of mod podge to the glass surface. I added glue to the top of the bottle's neck but you could add glue around the middle or the bottom of the bottle. Cut a long strand of twine in your desired color. The length depends on how wide and thick you want your stripe. You can always add or cut your strand. To reuse bottles after your event, carefully remove the twine, soak the glass bottles and scrub off the mod podge. In summer there is nothing I love more than Peonies. Especially in pink! And mixing them with pops of green and something unexpected (like key limes) creates the most perfect summertime centerpiece. STEPS Fill the vase with warm water. Warm water helps to speed along the blooming process, which helps if your peonies are not open yet. above the nodes or joints. Apply tape to the the top of your vase in a large criss-cross pattern. If you are using a smaller vase this step isn't necessary. Trim the dianthus and viurnum opulus and begin placing into the holes between the peonies. The stems of the viurnum opulus may not touch the water, so you can either fill individual vessels full of water and for these or soak your foam oasis brick in water and position it high enough in the vase to allow the stems to reach it. Place peonies evenly into the crisscross tape pattern on your vase. Decorate with paper! Paper chains and favor decorations made of construction paper add lots of color but require little effort or cost. Combine the whole milk and heavy cream in a heavy bottomed, medium pot. If using fresh corn, cut the kernels from the cob. Add kernels and cobs to the pot. Split the vanilla bean down the middle and scrape the seeds from the middle with a sharp knife. Add vanilla bean seeds and pods to the pot as well. Bring to a boil. Remove from the heat and bring to room temperature. Remove the vanilla bean pods and corn cobs. Puree the mixture in the blender and strain through a fine mesh sieve. Return to the stove over medium heat until small bubbles form on the surface. Remove from heat. In the meantime, whisk the egg yolks with the sugar and salt. Add 1 cup of the hot milk mixture to the egg mixture, pouring slowing and whisking quickly. This will temper the eggs. Add the egg mixture back into the milk mixture, again pouring slowly and whisking quickly. Prepare an ice bath by placing ice cubes and cold water in a large mixing bowl. Secure a smaller mixing bowl in the ice. Return the pot to the stove over medium heat and cook until the mixture thickens enough to coat the back of a spoon. Remove from heat and pour mixture into the bowl prepped in the ice bath. Chill in the refrigerator and process in an ice cream maker according to the manufacturer’s instructions. Freeze until hard. For the Crumble 4 cups Kettle Corn, divided Â˝ cup rolled oats 1 cup all-purpose flour 1 cup brown sugar 1 cup butter, frozen Preheat the oven to 375 degrees F. Place 2 cups of Kettle Corn in a large mixing bowl and lightly crush. Add rolled oats, flour and sugar. Mix to combine. Shred the frozen butter with a box grater. Add to Kettle Corn mixture and toss to combine, slightly working the butter into the dry ingredients. Spread the mixture on a parchment lined baking sheet. Bake for 10-12 minutes, or until the butter melts and the mixture become lightly golden. Remove from the oven and toss ingredients to recombine. Bake for another 10-12 minutes, or until golden brown. The mixture should still seem wet and buttery. Remove from the oven and add remaining 2 cups of Kettle Corn. Toss to combine and allow to cool. Once cool, break up larger pieces to make the crumble. Serve with ice cream. This adorable garland is from mellsva on Etsy. Madeline’s party was chill and fun – food, cake, balloons and a little bit of music for the kids. The hadmade touches and bright decorations might make this party look fancy, but really it’s just a combination of a bunch of balloons, hot glue and time. Hang a poster where guests can write a wish for your little oneâ&#x20AC;&#x2122;s future and their predictions for what she might become. This is a lovely tradition that will surely be appreciated and cherished when your child gets older. The summer issue. An online lifestyle magazine about home design, fashion, work and entertaining.